See the valance I sewed in the mirror? It was easy, too! I also hand painted letters bought from Michaels. While I was eight months pregnant with squirt blossom, Grayson, my husband took Gabriel to see his parents for a week (I was too preggo to travel). It was fantastic – I had a WHOLE week to myself! 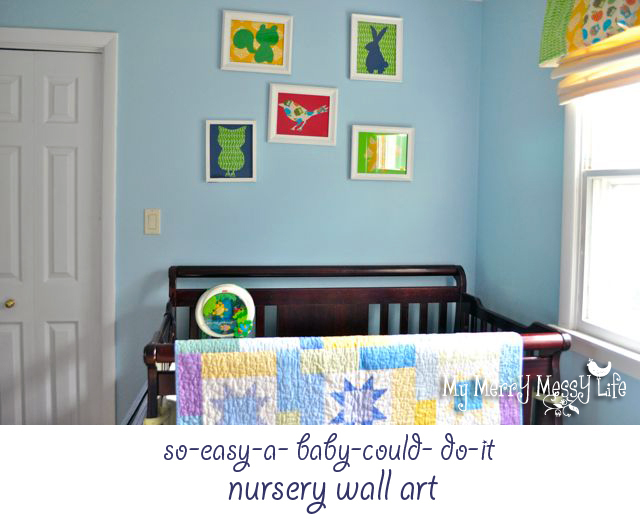 I went to town decorating Grayson’s nursery – sewing, cutting, and painting. I love simple, cheap decorating and this project is exactly that. I based the entire nursery decor off a quilt you can see in the very last picture, made by a friend of my mom’s. It is such a beautiful quilt and I knew I just had to use it in Grayson’s room to make it a custom-designed room. I bought fabric that matched the quilt to make a valance and crib skirt, then used the leftover scraps for the wall art and for the panels on Grayson’s consignment sale dresser. It added such a pop of color! I just love yellow for a baby’s room. The frames were leftover from our wedding, so they were free! But you can also get cheap frames at garage sales and flea markets. You’re going to paint them, so it doesn’t matter if you hate the color. Just focus on the size and design you want. Empty frames in whatever texture, shape and size you want. But, 8×10 is easiest because it fits a piece of card stock paper. First, paint all the frames the same color to match the room. I chose white because we had leftover glossy white paint from painting the trim in our house. I used a foam brush and it worked wonderfully! Next, do a google search for drawings and silhouettes of whatever objects you want. I chose woodland animals. Right-click with your mouse on the image itself and choose “copy image”. 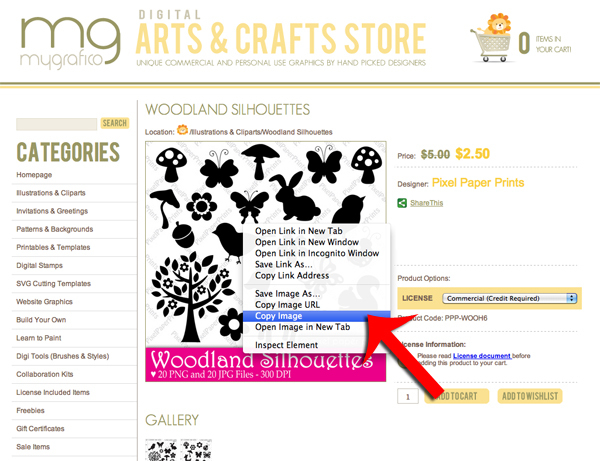 Open Word, right-click on the document page and choose “paste.” The image will appear. In this example, I chose to crop out the deer. To resize a picture without losing its aspect ratio, make sure you hold down the shift key so it keeps it’s original proportions. Here was my result! Now, print it, cut it out and trace it onto the paper or construction paper. Then, paste it to another piece of fabric or construction paper and frame it. I did a combination of fabric and construction paper animals and backgrounds to give it more interest. Voila! 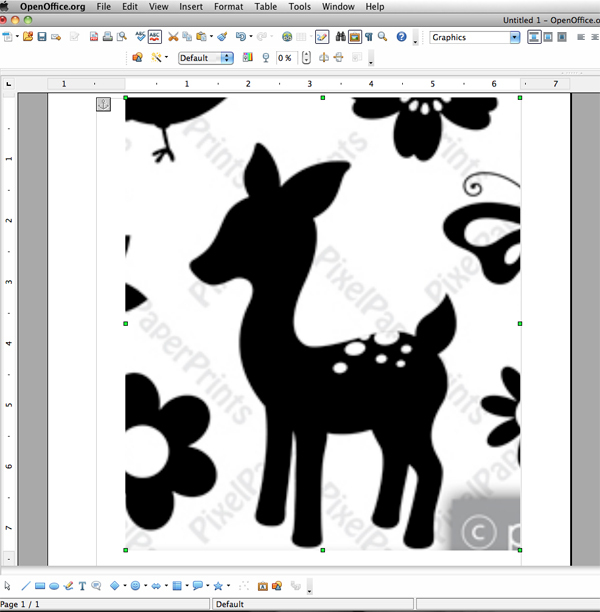 You now have cheap, easy and cute graphic art for your nursery!